Pomegranate tree growing plant of the genus Punica also known as Punica granatum. Pomegranate tree perennial mostly deciduous, but in warm years it’s very rare that Pomegranate tree evergreen plant, can grow as tree or shrub also used as ornamental plants, can grow in mediterranean, desert or subtropics climate and growing in hardiness zone 8-11. Leaves color green when the leaf is young the color is red green. Flower color red its look little fruit. Fruit has crown and the color of the rind is red or pink, the color of the fruit is red, pink or white. Inside the fruit there is white membrane. (1 Gallon) RUSSIAN Pomegranate Tree, considered the sweetest of all pomegranates. Very cold and heat tolerant, produces very sweet red fruit. (2 Gallon) RUSSIAN Pomegranate Tree, considered the sweetest of all pomegranates. Very cold and heat tolerant, produces very sweet red fruit. Is it necessary to graft in Pomegranate tree? 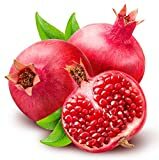 What can be done with big quantities of Pomegranate tree fruits?